dance.net - My latest dress (10184156) - Read article: Ballet, Jazz, Modern, Hip Hop, Tap, Irish, Disco, Twirling, Cheer: Photos, Chat, Games, Jobs, Events! Not posted for ages, been busy studying to become a college lecturer, but thought I'd share my latest creation which debuted on the first day of the Worlds. Dancer's mum applied the stones.. I had an assignment to complete. Very elegant and it flatters the owner perfectly. What does the shawl look like? Very pretty...would also love to see the back! Am waiting for a picture of the back. The shawl is the middle piece of the bodice design... the fleur de lys ... turned the other way. The appliqué continues round onto the back and across the shoulders. Pics show back of dress during construction, designs for front bodice and sleeve. Ah. 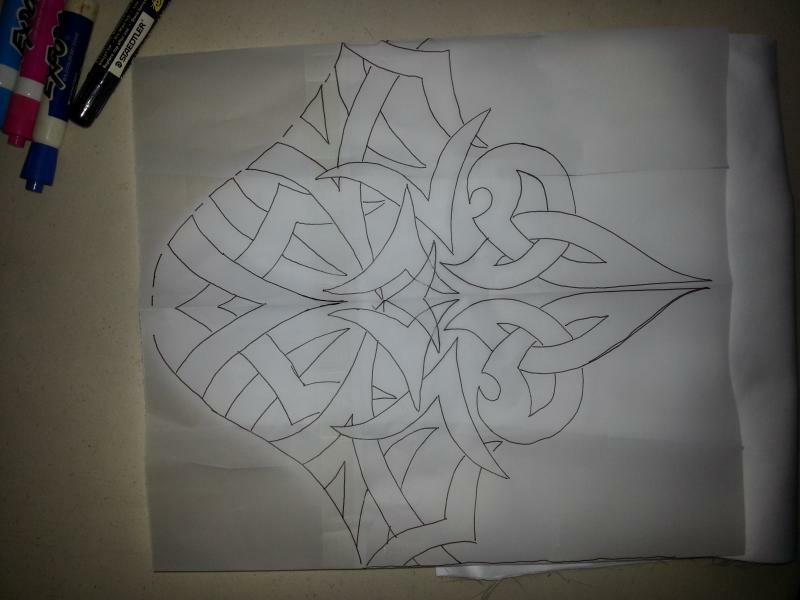 I never noticed the fleur de lys on the bodice incorporated into the knotwork until you mentioned the shawl. Nice design job! I'll be watching for the shawl. 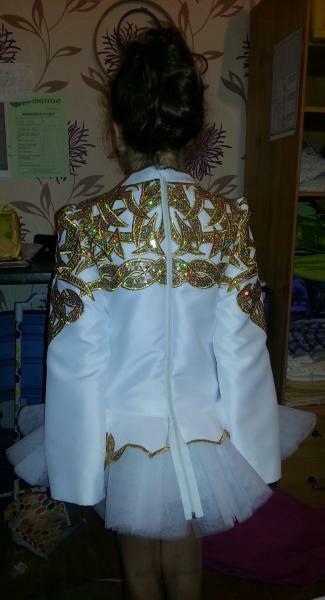 The dancer's mum wanted as much gold as possible on the dress and decided on gold metallic thread to outline the sequin appliqué, nightmare getting the tension right on my old Singer 20UX. 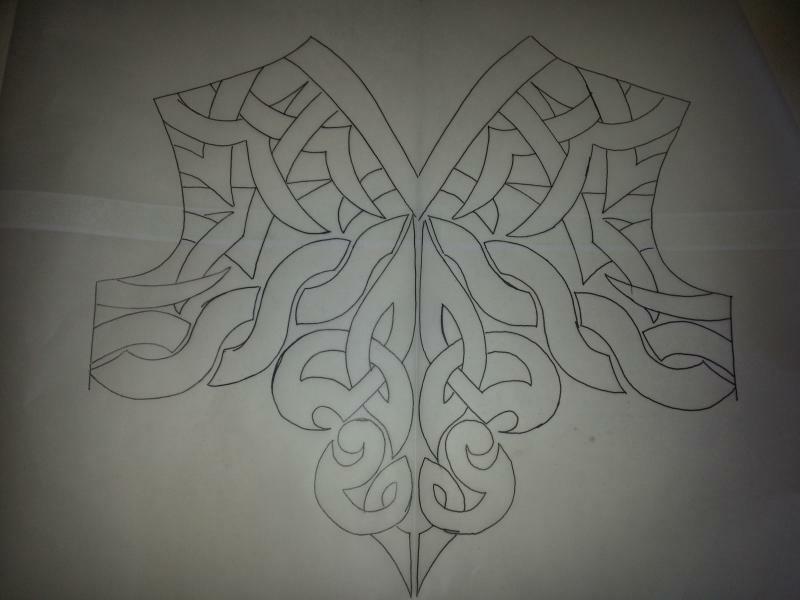 Another colour would have shown the design more, and probably been less stressful, but that wasn't what the client wanted. Will post a pic as soon as I have one. Get the tension right. Sometimes an overlay of wax paper helps, too. Its very intricate and kudos to you for working with that ornery thead!